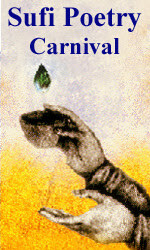 Sufi Poetry Carnival will be held for the first time in the cyberspace on 28th May 2007, God willing. The very first edition will be hosted jointly by Inspirations and Creative Thoughts and Knocking from Inside. As a classical rule, Sufi Poetry has always been the expression of Love for the Divine. The theme of the carnival is Divine Love. We are happy to say that few of the most respected contemporary sufi poets, Dervishes, translators of sufi poetry and authors will grace the carnival with their kind participation. Notable among them will be, Kabir Helminski, Coleman Barks, David Fideler, Daniel Abdal Hayy Moore, Irving Karchmar, Sabrineh Fideler and Aida Toure. Also there will be participations by many blessed hearts across the globe and each of their poems will testify the outpourings of Love for the Divine, no doubt. If you happen to express in poetic language and have work on the theme of Divine Love, you are welcome to participate. Join us in this Caravan! Many thanks to those who have already submitted their work. See you there again in the circle of lovers! :: Appreciation to International Exchange for Poetic Exchange, Poetry Chaikhana, Writeous Sister Speaks, Blogbharti, SufiNews, Original Faith, Ethnically Incorect Daughter for sharing announcement about the carnival.